As we fastened the dingy and neatened the deck, we were preparing our hearts for the wrench of leaving the “City that never Sleeps”. We understood so well that the chances of any one of us ever visiting here again, were extremely slim. What we were not preparing for, was the hold that the Hudson River had on Shang Du as we tried to lift our anchor. One child in front, on the pulpit, ready to hose down the chain and anchor as it comes up from the yucky depths. Two children sprawled in the forepeak, wormed halfway into the chain locker – one to shine the torch and the other to deflect the chain into a neat pile (wearing a huge working glove). The third child at the wheel, waiting for directions from Dad at the front. You know….. “5 seconds forward!” “Hold!” etc. One Mom inside, giving a last once-over to see if there is anything that we forgot to tie down that just might come crashing down in the rolling seas. Everything was going smoothly. The normal ke-chunk ke-chunk ke-chunk as the anchor chain came up. Then… silence. The windlass straining. Instructions from Dad to reverse. Move forward slowly. After all, this anchor had been here for more than a month! Let’s work it loose! Try again! Nothing! It still wouldn’t budge. And then… the Hudson just wouldn’t give up our anchor and Shang Du’s windlass broke down under the strain. This was a clear sign to stop. Nothing for it. Frans would have to dive to check out what was what. By God’s grace, we had full diving tanks on board. 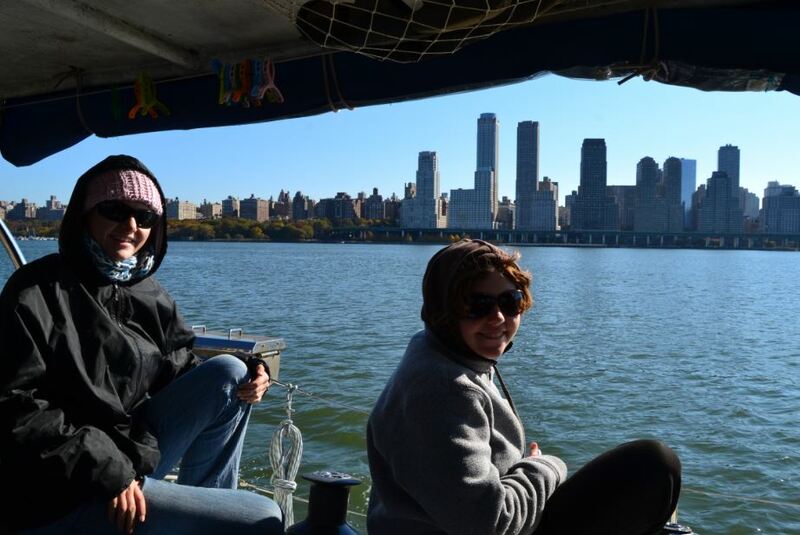 But….. this was the Hudson River, not any old anchorage next to a tropical island. There is always a strong current, the direction of which is determined by the tide. Before Frans could even attempt to dive, we had to wait for the turning of the tide. This brings only a small window in which the current is at its lowest point. 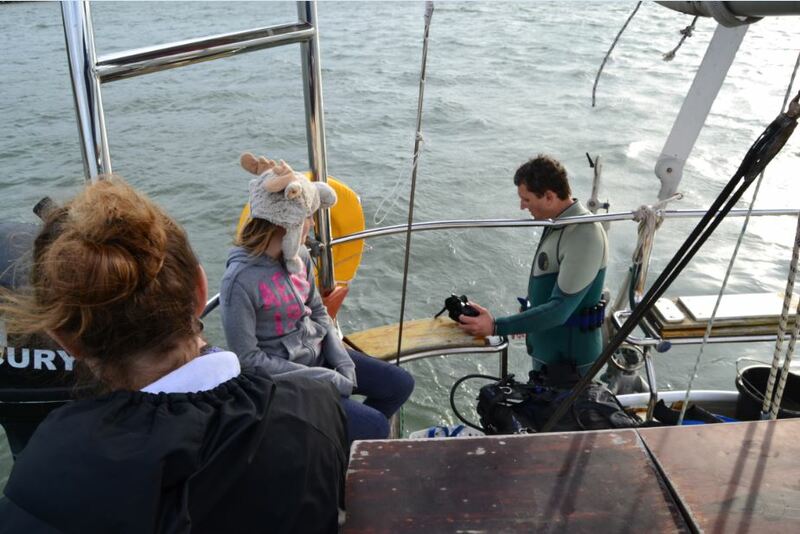 On the 3rd of November, at 16:00, Frans did his first dive. He quickly cleaned the speed-log while he was down there and then proceeded to the anchor. He found a huge jumble of chain and rope with a mooring block, all attached to our chain. No easy solution. The visibility on the first dive was about a meter and that was the best it would ever be. The temperature of the water was 17°C. 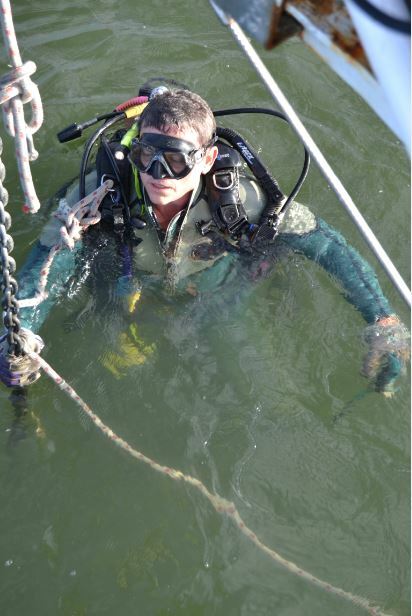 Frans managed to untie one shackle from the crow’s nest before he had to terminate the dive. Next time-slot was only at 21:00 that same night. Frans was feeling very despondent. Really NOT looking forward to more of the same. This was the very first time in all the 27 years that I have known him, that he didn’t want to dive. He absolutely adores diving. Instead, he spent his waiting time mulling over what he would do when he was down there. His second dive was much more difficult than the first one. The visibility was down to less than 30cm now. It was night. He managed to saw through a few things and attempted to undo the nest. This was extremely difficult, because the whole concrete block was now off the ground and moving up and down alarmingly. After 39 minutes, he called it a day. Or rather a night. His support team provided hot drinks and sympathy. Next time-slot was 8:52 on the 4th of November. This third dive was during broad daylight, but Frans reckoned that for all he could see, it might have been the middle of the night. He wore his torch next to his face, on his mask, so that he didn’t need to think about it. On this dive he attached a line from Shang Du to the anchor chain after the mess on the bottom. This was effectively to attach the boat to the anchor again, so that the strain on the jumble of chain and stuff would be lifted, hopefully making it easier to untangle it on a subsequent dive. He also succeeded in cutting loose a buoy attached to the mess. This came bobbing up to the surface. To his support team, it looked as if things were happening at last. Dive 4 at 16:15. Good news indeed! Frans found that the big mooring block fell off by itself since the last dive. He set to work to cut off a smaller anchor from our chain. 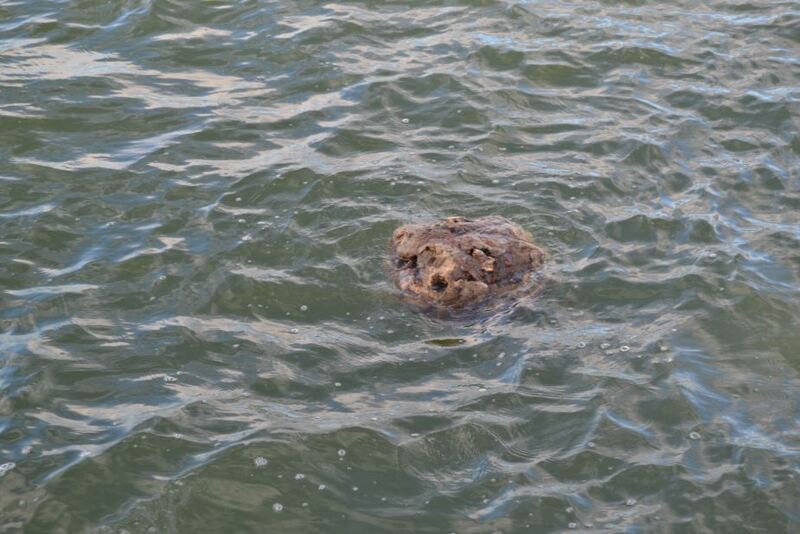 Obviously, we were not the first to have our anchor swallowed up by the lurking debris in the depths of the Hudson. Dive 5 at 3:17 in the morning. All the remaining chains fell off during the night and we had a free anchor chain and anchor! Praise the Lord! 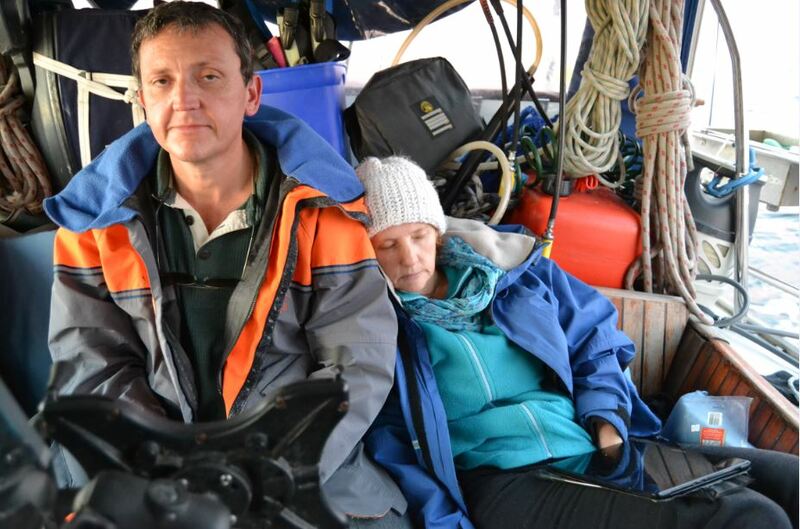 On the 5th of November, at around 10:00 in the morning, we hauled up our anchor at long last. Except, that this time, Mom was at the wheel. This was so that one child could assist Dad with the laborious work of bringing up a very heavy chain and anchor, using the winch. We still had a faulty windlass. So, yes. It really was hard to leave New York. Emotionally and especially, physically. But we managed in the end.